← Seven – Game On! Six days until my surgery. Getting close. Today I wanted to talk about one of the things I am doing to get ready for the surgery. 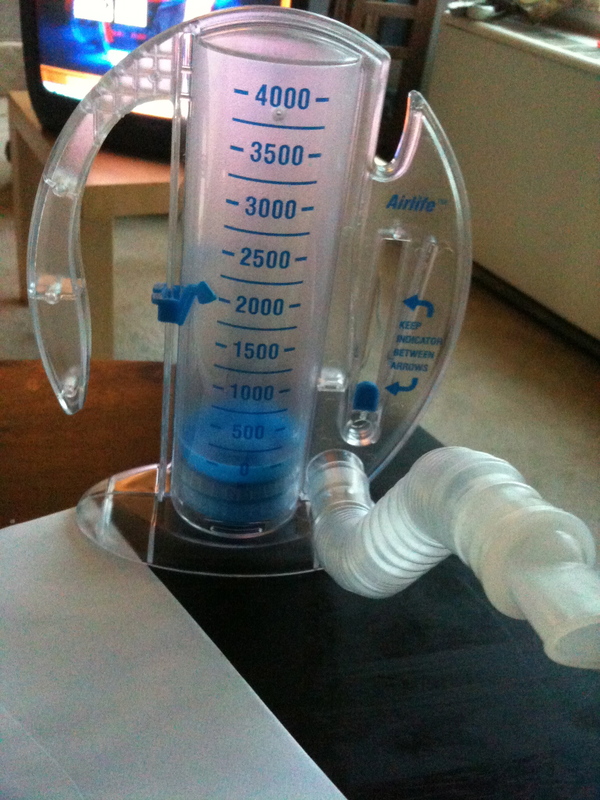 An incentive spirometer is used to help you with breathing and increasing lung capacity. Basically, it is used to practice deep breathing and exercise your lungs. The goal is to take slow deep breaths keeping the indicator on the right between the two arrows. At the hospital, they said that average people with normal lung capacity can reach about 2000. An active athletic person can reach up to 4000. I can usually get between 1500 and a little over 2000. I received mine when I went tot he hospital for the nutrition class. I practice this ten times in the am and ten times in the evening. I have to bring this to the hospital with me for the surgery. I will have to do this after the surgery to help my lungs recover from the anesthesia and the surgery as a whole. I actually use this more than is required. I like trying to increase my ability to breathe. I hate having asthma and struggling for every breath. I am ready to strengthen my lungs as I lose weight. If I can return my breathing to normal levels, I know losing weight and exercising will be much easier. This entry was posted in asthma, breathing, diet, fat, fat chick, gastric by-pass, health, incentive spirometer, life, lifestyle, skinny, Uncategorized and tagged asthma, breathing incentive spirometer, fat, fat chick, health, life, lifestyle, lung, skinny, skinny girl. Bookmark the permalink. Aw, yours looks so much cooler looking than mine. XD I’ll be keeping you in my prayers next week. Make sure to post and let us know when you’re on the other side! oh i will. i may make my sister do a post on wednesday to let everyone know i came out of surgery ok.